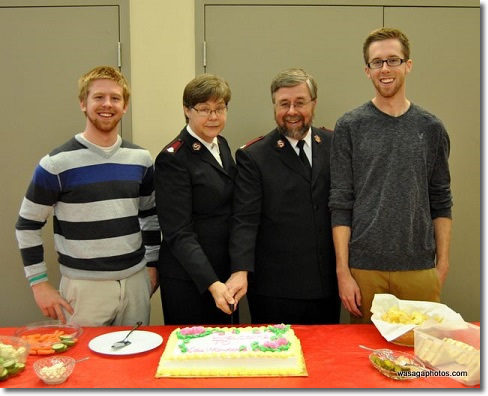 Majors Neil & Merrilee Evenden were appointed as the Corps Officers / Pastors of The Salvation Army Collingwood Community Church in March of 2013. The Evendens lead all aspects of the ministry and operations of The Salvation Army in Collingwood. The Evendens were privileged to visit the Holy Lands (Israel & Jordan) in the fall of 2015. This experience has enhanced their understanding of Scripture. The Evendens were both commissioned and ordained in 1985 and have served in a variety of roles. They have served as Corps Officers in Melfort, SK; Dunnville, ON; Saut Ste. Marie, ON and Midland, ON prior to coming to Collingwood. They have also served in Divisional Headquarters appointments in Regina SK, & Orillia ON where they facilitated Children’s and Youth Ministries and operated Camps (Beaver Creek, SK & Camp Newport,ON). They were as assigned to the Territorial (National) Headquarters in Toronto ON, where Major Neil Evenden was assigned to the Computer Department and Major Merrilee Evenden to the Ethnic Ministries and the College for Officer Training. Major Neil Evenden is an active member of the Rotary Club of Collingwood. The Evendens have two grown children and are excited to welcome a Granddaughter in Dec 2017.